When will an agent detect that the device has gone offline? The agent marks the device as offline (and therefore triggers any callback registered with device.ondisconnect()) when the device fails to respond to pings. On average, a WiFi or Ethernet device will be marked offline when it has not been seen for ~270 seconds (4.5 minutes; maximum time is ~9 minutes). This period longer for cellular. For some sample code demonstrating this, please see ‘Monitoring Device Disconnections From The Agent’. How accurate is the imp’s internal clock? Time in agent Squirrel is set by NTP in our cloud-servers, so it is monotonic, accurate and free of systematic drift. The accuracy of any imp when offline is based on the crystal it is connected to with a product by the product’s manufacturer. Typically, these are 32kHz parts, and when tuned correctly (ie. with correct load capacitors) are accurate to approximately 20 parts per million, ie. about two seconds, per day. The imp005 is an exception: it drifts with the frequency of its internal 37.4MHz crystal. Time in device Squirrel on imp005 (or any other imp which does not have a 32kHz crystal) is completely incorrect until the imp connects to the server each boot. When online, the imp’s internal clock is synced with the server many times per hour, so as long as impOS is able to process inbound messages (ie. it is not blocked for long periods by your application Squirrel), the imp will stay ~±1s or so from the server clock. Synchronization occurs over the imp’s TLS connection, which accounts is why it’s not an NTP accuracy sync. It is not monotonic; it can be between one second fast and n seconds slow, where n is the “ping time” to our servers (in whole seconds, rounded up). The microsecond counter returned by hardware.micros() (and indirectly by hardware.millis()) is monotonic (except when the imp restarts, and when 32-bit integers wrap), and drifts with the fast crystal. No attempt is made to synchronize time and the microsecond counter on devices with two crystals, so they drift independently. Better time-of-day clocks (MSF, GPS, etc) can be added to the imp as external peripherals. How do I determine the impCloud servers’ IP address range? We do not expose external IP address ranges for public impCloud™ servers. The public impCloud has many IP ranges, and all addresses change at every deploy. As such, the device cannot ‘expect’ to connect to a specific IP address or range of IP addresses. In order to maintain the impCloud’s high levels of reliability and scalability, devices must be able to move from server to server for load balancing, or because of a hardware failure. A given devices may therefore connect to different servers with very different addresses at different times in its lifecycle. Again, fixed IP addresses would severely hinder this mobility. If you require server IP addresses for the purposes of whitelisting devices at a network firewall, we offer a proxy service which routes the public impCloud servers via a proxy server at a fixed IP address. For more information about this additional service, please contact Electric Imp Sales. How do I determine an agent’s IP address? The impCloud™ servers on which agents are hosted are not maintained at fixed IP addresses. In addition, any given server may be host to a great many individual agents. As such, we do not provide details of agents’ IP addresses, only their URLs, which can be accessed via the agent-side imp API method http.agenturl(). Finally, an agent’s URL is also displayed in the impCentral code editor. How do I determine an imp’s IP address? Call imp.net.info() in your device code. This will return a table of network-specific information. You need the ipv4 key — its value is also a table and this contains the key address which will be the imp’s current IP address as a string, eg. "192.168.0.3". This value can be written to the device log, or relayed via UART. How large can my Squirrel code get? The Electric Imp IDE, and the impCentral API, put a limit of 4MB on your Squirrel agent code. The same limit is also applied to your device code. Neither agent nor device code can be larger than 4MB. What happens if I use the BlinkUp API key from a different account in my app? The BlinkUp API key you use to make calls to the BlinkUp SDK’s methods must be the one associated with your account. If this is not the case — for example, it is used with devices blessed to application firmware that is associated with a different account than yours — then your end-users will not be able to perform BlinkUp with your app successfully and they will find their devices are unresponsive. How do I customize the text in a BlinkUp interface? Almost all of the text in the BlinkUp process can be customized for your application. The Android BlinkUp SDK allows you to set these programmatically; the iOS BlinkUp SDK includes a file of strings which can be edited. Both SDKs also include default BlinkUp strings. What is the difference between standard and custom BlinkUp? Standard BlinkUp presents a user interface generated by the BlinkUp SDK. It allows the user to select which network they wish to connect to, and then perform a BlinkUp. You and your app developer can customize much of the text presented throughout the process. If you feel you want more control over the look and feel of the BlinkUp process, you can do a custom BlinkUp. This integrates BlinkUp into your own network-selection UI. More information on this process can be found in the documentation accompanying the BlinkUp SDK. Can I have the same agent URL for a device no matter what? This is not recommended and should be avoided. Each user has their own plan ID to ensure proper security. Please spend some time architecting your use and management of agent URLs in your app and on your server. Develop a proper plan for the agent URL before launch. When using an agent to download a very large file, it is helpful to determine the size of the file first so that you can request the file in manageable chunks. The standard way to do this is to use a HEAD request: call http.request() with "HEAD" as the first argument. The request can then be sent, and the response’s Content-Length header examined. Unfortunately, this operation may fail: the request will timeout. To avoid this, make a GET request which contains the Range: bytes=0-0 header. The response will contain a Content-Range header which contains the size of the file: eg. 0-1/17616, where 17616 is the size of the file in bytes. This will blink the imp’s light for 30 seconds whenever it starts up, including power-cycles and waking from deep sleep. Set this for a decent duration to give you time to re-BlinkUp while the last WiFi network is still ‘visible’. Agents can currently fetch no more than 512KB at any one time using HTTP. This is not a serious limitation in most circumstances, and is more data than the device can sensibly deal with in any case. But for the rare situations in which fetching a larger file is needed, there is a workaround: the file can be streamed, by fetching it in sections using the HTTP ‘Range’ header. The following code streams the Electric Imp homepage in 1KB lumps. The page is actually much smaller than 512KB, so could have been fetched in one go, but it nonetheless demonstrates the technique well. The following code provides a very simple — if inelegant — way of acknowledging receipt of a message. The code here assumes the message has been sent from agent to device, but the same technique can be used for messages travelling in the opposite direction: just flip agent.send() to device.send() and agent.on() to device.on(). If you are looking for a more sophisticated approach to managing agent-device communications, please take a look at our Message Manager library. It allows the basic imp messaging API to be extended in a number of interesting and useful ways. Many web services return data in JSON format, and the imp API has a number of useful tools for converting JSON data into more readily usable forms. However, some web services send data as XML, and this can be more tricky to extract, especially if the order of the XML tags is not constant. Fortunately, impOS™ provides a regular expression object, and this can be used to examine the incoming XML for specific tags. which says match against any number of characters 0 through 9. The square brackets delimit the range of characters we’re interested in; the plus symbol says ‘match against one or more characters’. With the regexp2 object instantiated, we call its capture() method, passing the data we want to match the regular expression to. This method returns an array of tables, one table for each match. Each table contains two keys, begin and end, which are the positions within the passed string data of a sub-string matching the regular expression. We check that we have at least two matches and if so use the second of the two tables in the results array. We use the begin and end values to extract the number embedded in the XML and return it as a string. The first entry in the results array includes the XML tags, so we ignore it. Regular expressions can be used to detect complex patterns of characters as well as the simple ones used in the example above. Take a look at the the documentation on the regexp2 object for more information on how to assemble regular expressions for string matching. The regexp2 object makes use of the Google re2 regular expression engine, which is a considerable improvement upon the standard Squirrel regular expression evaluation functionality provided by regexp. We recommended new code uses regexp2 in preference to the standard functionality. However, re2 memory usage issues mean that regexp2 is currently only available in agent code, a regexp2 regular expression is limited to 256 characters, and each agent is only allowed to have up to ten regexp2 objects simultaneously. The standard functionality will continue to be offered for device code and to maintain compatibility with older agent code. Here are some general tips for reducing the size of your device or agent code. For a more in-depth discussion of some of the techniques you can use to boost performance and reduce your code’s memory footprint, please see ‘Writing Efficient Squirrel’. Keep your variable names short — though you should make sure it’s still clear what information they hold. Comment out variables you have added but not used. You can always ‘un-comment’ them later. Do you use all the methods defined by a custom class? If not, comment out the ones you don’t need. Use /* and */ to block out large sections of code. Again, you can always ‘un-comment’ them later. Please see this Developer Guide: ‘Endian-ness in Squirrel Code’. impOS™ now provides ‘polite deployment’ functionality. This allows application code to register to be informed when there is an impOS and/or Squirrel code update available to be deployed, and to take action to defer the installation of such updates. Many methods in the imp API allow you to register a function that will be automatically called when at some time in the future an event takes place. These functions are called ‘callback functions’ or ‘callbacks’. When Squirrel encounters this, it parses the line and sees that it must call aCallbackFunction() first in order to determine what value should be passed into imp.wakeup()’s second parameter. Of course, aCallbackFunction() may return a function reference, but it it does not, its return value will still be used by Squirrel as the reference to the function to be called when the timer fires. The result is unpredictable, but will most likely cause a runtime error. The rule of thumb, then, is: to execute a function now, append brackets to the function’s name; to register the same function for execution later, omit the brackets. When a device goes offline, its agent will stay online and accessible via its unique URL. However, if the device remains offline for an extended period of time — currently 30 days — the agent will be shut down automatically to conserve server resources. The agent is stopped; it is not deleted. If a mobile application, web site or third-party server attempts to contact the agent after this point, they will receive the standard ‘resource missing’ HTTP status code, 404, indicating that the agent is offline. Be aware, however, that a 404 status code is not a guarantee that an agent has been stopped. An agent can itself issue a 404 HTTP status code; it does so when it receives an HTTP request but has no HTTP request handler function registered using http.onrequest(). As and when a device comes back online, the disabled agent will automatically be restarted. Any data previously preserved using server.save() will still be accessible. The rebooted agent will continue to be contactable at the same URL as before. Please see ‘Polite Squirrel Deployment’ for the latest information. 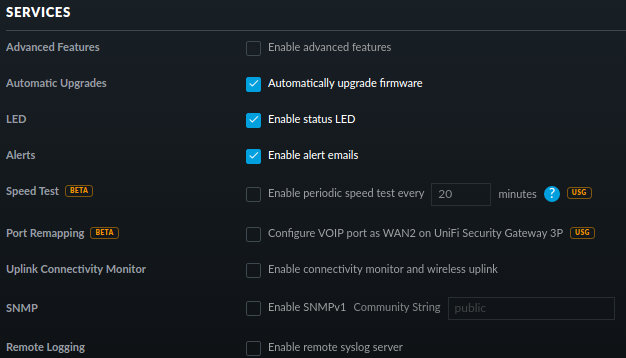 If you configure an imp-enabled device to connect to your password-protected WiFi network but subsequently downgrade the security of the network by removing the password, the on-board imp will no longer connect to the network. To re-connect, the device must be reconfigured with a blank password. This is by design. It is intended to prevent your device (and other devices on the network) being ‘captured’ by a rogue WiFi access point masquerading as your network router. It can do this by transmitting the same SSID as your network but at a higher signal strength, but without the password, which the assailant does not know.